On the weekend of October 20 and 21, the St. Michaels Community Center welcomed nearly 700 guests to enjoy the SMBA Pumpkin Carving Competition and the SMCC Pumpkin Pie Competition. 17 Carvers came out to dazzle the judges with their incredible talent and 6 Chefs from local businesses and 10 home bakers vied for top prizes in the pumpkin pie bake-off. 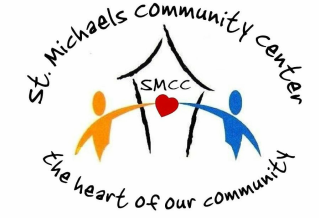 The St. Michaels Community Center is committed to keeping the community spirit alive and well in St. Michaels and across the Bay Hundred Area. Every summer we host a concert series for families and neighbors to enjoy in Muskrat Park, our annual pumpkin pie baking context has created a healthy rivalry between local professional and home bakers, and our theatrical productions draw more than 1,500 patrons each year. In addition, many community activities promote family togetherness such as our Annual Family Shorebirds Game, Spring and Fall Block Parties and Holiday Dinners at Thanksgiving, Christmas and Easter. Many of these programs are funded in part by a grant from the Talbot County Arts Council, with revenues provided by the Maryland State Arts Council. Thursdays over the summer are for music in the park. Our series of concerts in Muskrat Park feature local artists from all across the Bay Hundred Area and attract more than 2,400 concert-goers each year. When weather permits, these evenings are perfect opportunities for families and neighbors to enjoy picnic dinners and free music. Our annual Pumpkin Pie Contest is held during the "Fall Into St. Michaels" celebration and has created a healthy rivalry between local professionals and home bakers for the bragging rights to our Championship Award. Community members ages 5 to 85 participate in our annual theatrical productions, which draw more than 1,500 patrons each year. We're delighted to provide free holiday dinners for families and friends who otherwise would not enjoy Thanksgiving, Christmas and/or Easter meals. Several of St. Michaels restaurants, markets and individuals support our dinner guests with donations of food, supplies and service. Spring and Fall is when SMCC takes to the streets and hosts a good ol' fashioned street party and cookout for all of our neighbors and friends. Hot dogs, burgers, fries, chicken, salads, ice cream and desserts are as plentiful as laughter, games, fellowship and music. Everyone is welcome.